(Budapest, HUN) -The 30th European Swimming, Diving, Synchronised Swimming, and Open Water Swimming Championships concluded on Sunday, August 15th, and will now keep a memorable place in the 84 year-long history of the first and foremost LEN Event. LEN President Nory Kruchten expressed special thanks to Hungary for hosting the event for the fourth time since the premiere in 1926, also in Budapest. (Budapest, HUN) - The European Swimming Champs Budapest 2010 concluded Sunday with 2 new CRs: Y.Efimova RUS (video) in the W 50 breast (30.29) and France men's 4x100 medley relay (3:31.32). The new continental champions are: T.Alshammar SWE (video) in W 50 free (24.45); F.BousquetFRA (video) in M 50 free (21.49); K.Hosszu HUN in W 200 fly (2:06.71); L.Cseh HUN in M 400 IM (4:10.95); R.Adlington GBR in W 400 free (4:04.55) and Russia women's 4x100 medley relay (3:59.72). Click up the title for the Day-7 Photo Gallery or over the link here for the Day-7 results. From SRB squad, in the W 50 breast Jovana Bogdanovic ranked 32nd (34.27). In the M 50 free Boris Stojanovic place 39 (23.30), while Nikola Simic 53rd of 61 athletes (23.81). In the W 50 free Miroslava Najdanovski ranked 23rd of 49 (26.06), while Andjelka Petrovic 38th (26.62)... See full results. M.Najdanovski, SRB record holder with coach D.Pejinovic. (Ph by I.Rasula). (Budapest, HUN) - Day-5 brought more new CRs. In the M 800 Free S. Rouault FRA (7:48.28), in W 200 free SF F.Pellegrini ITA (1:56.53), A.Herasimenia BLR in W 50 back SF (27.98) and A. Chaun RUS (2:23.50) in W 200 breast F. New champions are:A.Bernard FRA (video) in the 100 free (48.49) and S.Sjoestroem SWE (video) in W 100 fly (57.32). From SRB swim squad seven athletes took part in the qualification. Caba Siladji earned 5th place for SF in the M 50 breast (27.79). Ivan Lendjer ranked 6th in the M 100 fly SF (52.89). In the M 200 back L.Bogdanovski ranked 27th (2:04.01). In the W 200 free M.Ostojic is 38th (2:06.10), while T.Vukanovic placed 40th (2:06.50). In the W 50 back M.Strazmester ranked 21st (29.97). (Budapest, HUN) - On the Day-4 beside the three new CRs D.Gyurta HUN in 200 breast, K.Hosszu HUN in 200 IM and C.Lacourt FRA in 50 back, spectacular swiiming might be seen. New Euro champions are: Lotte Friis DEN in W 800 free (8:23.27); Gemma Spofforth GBR in W 100 back (59.80) and Pawel Korzeniowski POL in the M 200 fly (1:55.00)... Click up the title to open up our Special Photo Gallery from the Day-4 Semis + Finals..
D.Gyurta, HUN super star, at the Budapest'10 podium. (Ph by I.Rasula). Six SRB athletes took part in the preliminaries - N.Higl in the W 200 breast (2:28.59). J. Bogdanovic in W 200 breast (2:34.23). In the M 100 free R. Siljevski (50.44), Boris Stojanovic (51.21) and N. Simic (52.83). In W 100 fly T.Vukanovic(1:02.95). N.Higl (SRB) earned the W 200 breast Semi Final position. (Ph by I.Rasula). Y.Efimova, RUS - the European breaststroke queen. C.Lacourt - new French and European super star. (Ph by I.Rasula). From SRB swimming team, two girls swam out poor in W 100 back- M.Strazmester (1:04.91) placed 37th and J.Nikolovski(1:07.54) 44th. F.Pellegrini ITA, just 5th in 800 free. (Ph by I.Rasula). Y.Agnel, FRA, new world swim power, at the press stand. (Ph by I.Rasula). (Budapest, HUN) - Euro champs continued on the Day-2 morning heats, also with great times as it could be seen day before: in the M 200 free Izotov RUS ranked 1st (1:47.33) in the W 100 breast Pedersen DEN touched first (1:07.78), in the M 200 IM domestic star Cseh set his best (1:58.76). Six SRB athletes took part in the events: in 200 free Dj.Markovic (1:50.66) and R.Siljevski (1:51.29), in 100 breast N.Higl (1:10.97) ranked 22nd and J.Bogdanovic (1:13.59), while in the W 100 free M.Najdanovski (56.93) and A.Petrovic (57.39),..
N.Higl, SRB - worth start in Budapest. (Ph by I.Rasula). Men's 400 free podium in Budapest (Ph by I.Rasula). Men's 50 fly Semis (heat 1). (Transferred from RTS). 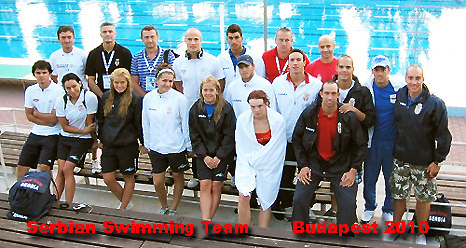 (Budapest,HUN) - The swimming competition at the Euro Championships 2010 started with the Day-1 morning heats. Few great times were set: Therese Alshammar SWE in W 50 fly (25.80), Camille Lacourt FRA in M 100 back (53.27 CR). I.Lendjer, SRB star - right to the 50 fly Semi finals.. (Ph by I.Rasula). (Budapest, HUN) - The evening prior to the start of the swimming competition at the 30th Euro Swimming Champs, everything is ready around the pool Alfred Hajos as well as with the competitors from 44 national federations. Start List is now available at the Omegatiming.com, while all actualities would be found here at our 'Last Events' page. For all visitors from Serbia and the wider region of SE Europe, Igor Rasulacovers the actualities of the Serbian squad via PSS Special Web Blog.. The Eurosport will broadcast the afternoon Semis & Finals events. See now our Sunday's Photo Gallery, an evening training prior to the Champs start.